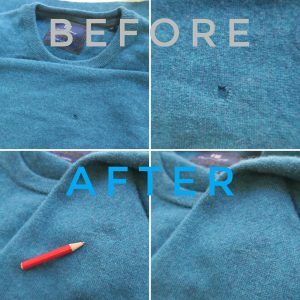 If you have moth holes, cigarette burns or damages from normal wear and tear on your beloved garments, invisible mending would be a good solution to restore your garments back to its original condition. Invisible mending uses threads from the original garment and then weaves these threads strand by strand into the damaged parts. Invisible mending is a highly recommended solution for suit pants, cashmere and wool coats. The time required and the cost of fixing would depend on the severeness of the damage and the amount of damaged parts. An initial assessment would be required for an estimation on feasibility and cost.